My daughter ,who is a professional photographer, purchased this settee a couple of years ago for use in her photo shoots. It is labeled Teena Original and from research online I found it is from the 50’s and seemed rare as far as this type settee. As you can see the velvet type material was faded and torn. It was also missing some of the tacks. 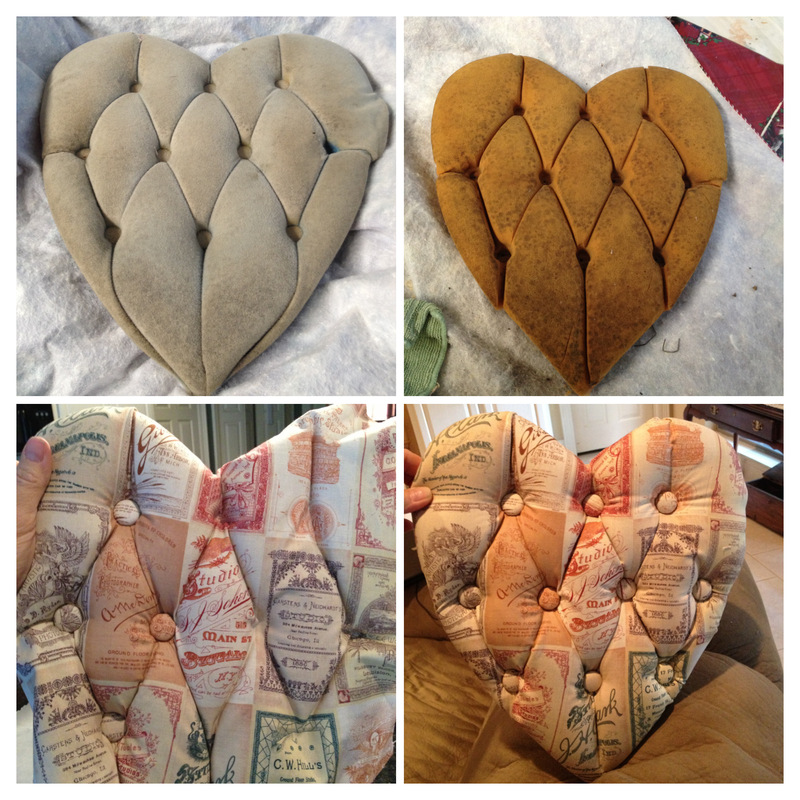 I have never upholstered something with tufting and tacks so I decided to take on this project and learn how to do something new. ( I actually needed this to keep my mind off of a stressful situation going on with my family – Crafting is always great therapy for me!) I went to my favorite store, Hobby Lobby, and bought the fabric. I knew I wanted something vintage and found this wonderful print of old Photography studio cards. (Perfect for my daughter!) 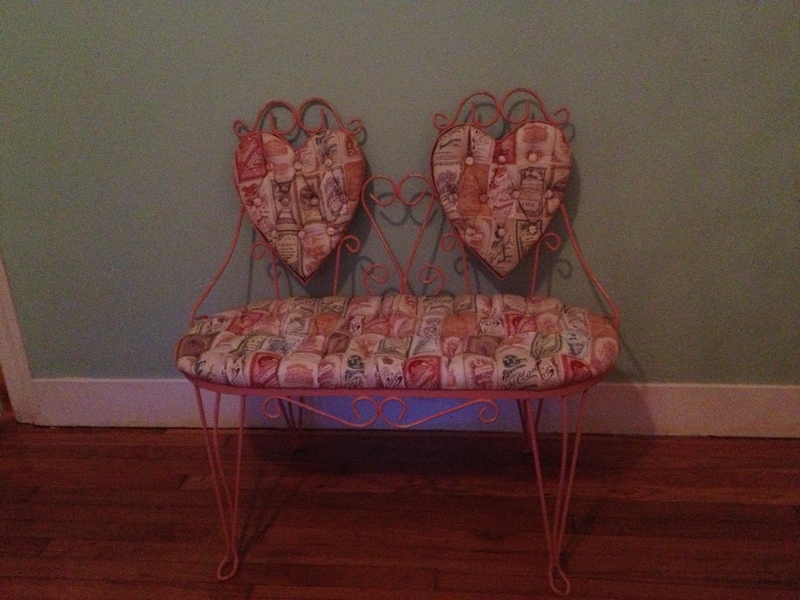 My plan was to do the hearts (backs of the settee) 1st and see how that goes and then decide if I could do the seat. Because I was able to reuse the original foam and tacks it was easier than I thought. The two biggest challenges were to figure out how to cover the 51 tacks with the material and replacing the original tacks that were missing. With my sister’s help we came up with a solution. We used a button cover kit to cover the new button with the cloth, cut off the button shank (had no idea what that was called till I looked it up on internet – LOL! 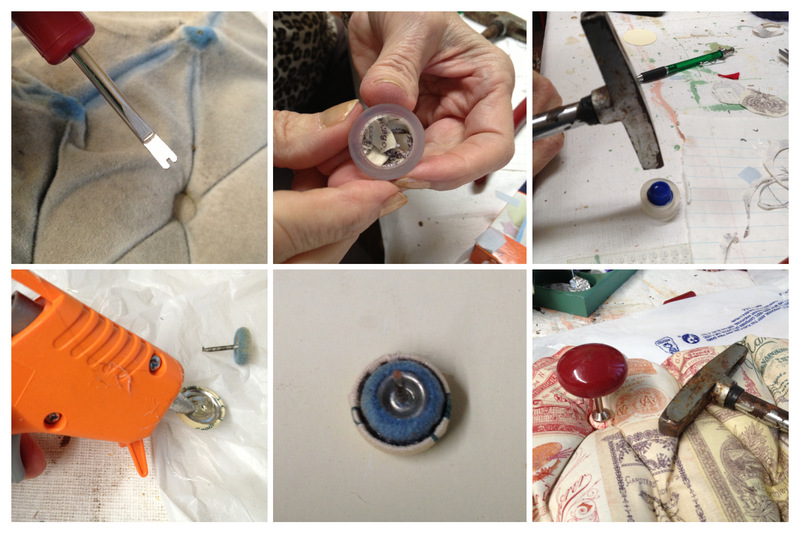 ), and then glued the old upholstery tack inside of the button. I bought new tacks to replace the ones missing. These were the hardest to get to stay because they were not as sturdy and the tops were not flat so they didn’t glue in the button cover very well. I found a really cool tool that has a magnet that goes on the tack and then you hammer on that. The tufting part was pretty easy since I just tucked it in the original creases. I did look at some youtube tutorials to see how it is done. 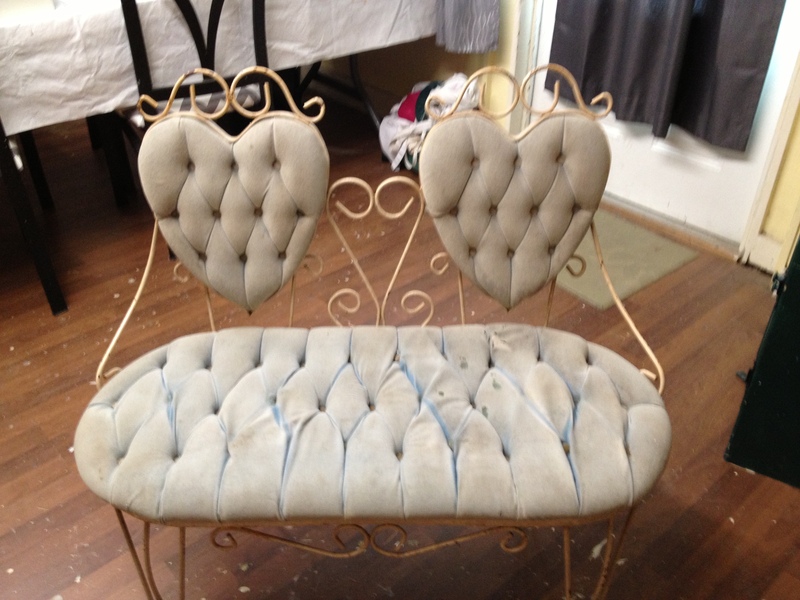 Overall it was a great experience and now I will I will not look the other way when I see a piece of furniture for sale that is tufted and needs to be redone. I made a few collages that will show some of the steps in doing this project. My daughter is very happy with it and she is using it in her home and will sometimes use it in photo shoots. She has been warned to be very careful with it and not tote it around to her outside shoots. We’ll see how that goes! I tried to match the material on the button to the area it was being tacked into. 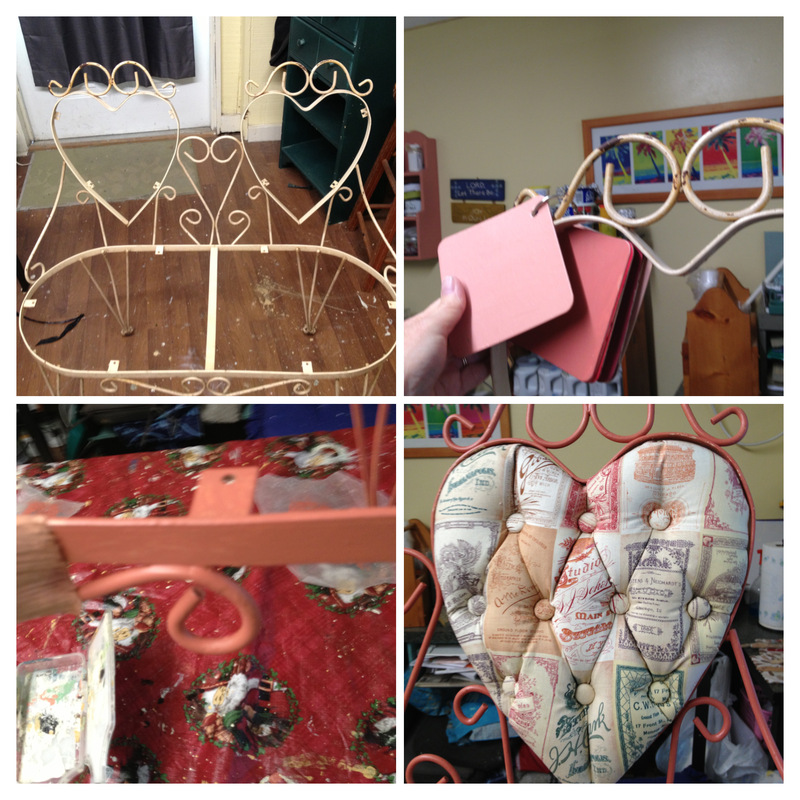 I painted the wrought iron base of the settee two tones of coral and distressed lightly. Here it is in my daughter’s house. update: My daughter’s house was flooded in the flood of 2016 in Louisiana. 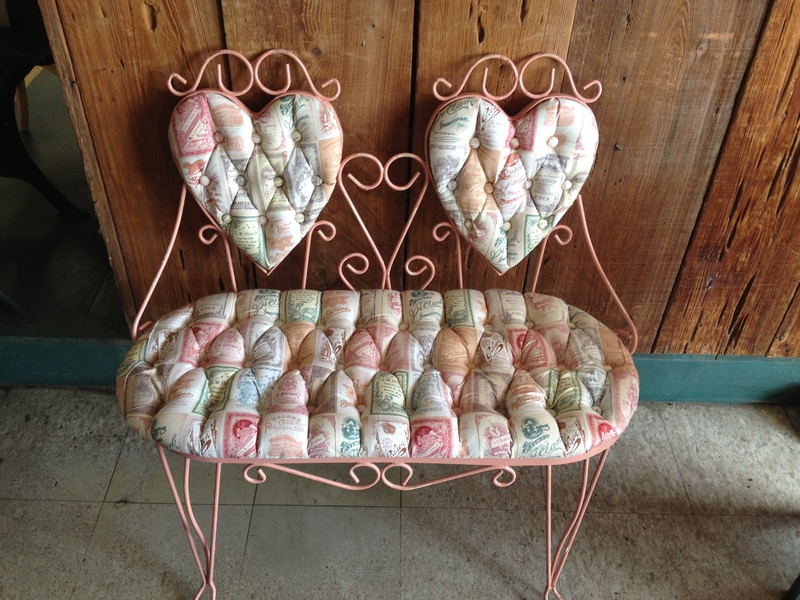 The piece is made of iron so I may be able to salvage that part but all of the hard work put into the upholstery – sadly gone -and I don’t know if I can ever do that again without having the original foam to work with.